The landscapes and hill towns of Umbria are familiar because they are little changed since painted by the Renaissance masters. This is the heartland of Italian culture, magnet for artists from Tuscany and Rome as well as a hothouse for its own painters. It is a land of saints, notably St Francis – we will be based at the Hotel Giotto in the heart of his city, Assisi. As well as the Basilica and frescoes, we visit the ancient Oratorio dei Pellegrini. With our distinguished tour guide Huon Mallalieu, art writer and The Oldie’s art correspondent, will also see Orvieto – the Gothic cathedral, and visions of heaven and hell. In Perugia, the finest 15th-century secular room in Italy; the haunting medieval city of Gubbio; and, in Todi, lunch on a terrace where the view is as exquisite as the food. For details of Hotel Giotto, visit www.hotelgiottoassisi.it. Thursday 26th April BA3279 departs London City Airport 11.00. Arrive Florence 14.05. Transfer to Assisi, Hotel Giotto. Introductory talk, drinks, dinner. Tour of the Upper and Lower Churches of the Basilica, frescoes and tomb of St Francis, the Oratorio dei Pellegrini, Temple of Minerva and Roman centre. Afternoon, antiques fair. The cathedral and chapels of the Caporale (altar-cloth), and St Brizio, (Fra Angelico, Luca Signorelli). Orvieto is home to the ‘Cittaslow’ concept, so a slow lunch at Duca di Orvieto. The cathedral and Giovanni Pisano’s Fontana Maggiore. After lunch the Collegio del Cambio, meeting place of the bankers’ guild, decorated with frescoes by Perugino. Next door, in the Palazzo dei Priori, is a fine collection of paintings. Then, a superb gelateria. Tour of the medieval streets and muscular Palazzo dei Consoli (pictured below). Potential visit to the Roman theatre below the town. Basilica of S Francesco, Piero della Francesca’s ‘History of the True Cross’, stained glass and the tomb of Gregory X. Casa Vasari, home of Giorgio, first art historian. 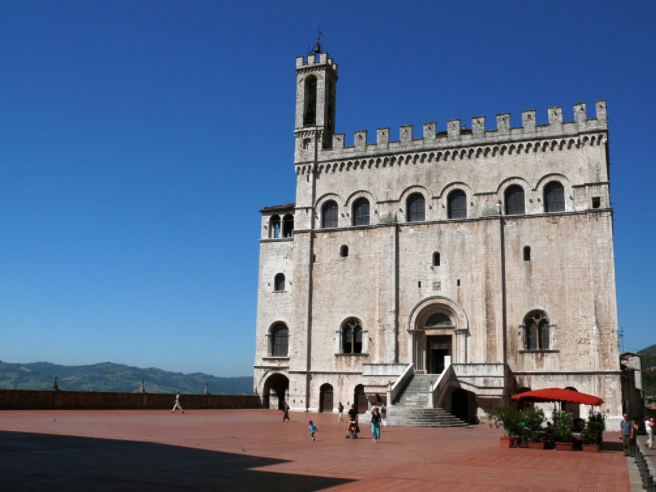 Wednesday 2nd May – Todi and wineries We visit one of the Montefalco wineries for a tasting on our way to lunch at Ristorante Umbria in Todi –famous for game and its glorious terrace views. Free time in the morning in Assisi prior to transfer to Florence. BA3280 departs 14.45. Arrive London City 15.55. Do book with Katherine to guarantee a place on reservations@theoldie.co.uk. Her number is 01225 427311. PRICE PER PERSON: £1,595 for those sharing a double/twin room, including everything apart from flights and drinks before and after lunch and dinner. We need to charge a single supplement of £150. She will require a non-refundable deposit of £750. Final payment will be due by 26th January 2018. For more information on all upcoming Oldie Trips join our mailing list. Just email editorial@theoldie.co.uk with the subject 'Trips Mailing List' and you will be added to it. Due to the recent collapse of sterling, The Oldie needs to protect itself against further sudden falls, and, hence, reserves the right to change the price of the holiday. The Oldie is happy to maintain the current price until the euro drops below €1 to £1, using FairFX’s currency rates as the arbiter. The current rate is €1.07 for £1. We will absorb (and you will not be charged for) any increase equivalent to 2% of the price of your travel arrangements, which excludes insurance premiums and any amendment charges. You will be charged for the amount over and above that, i.e. if the exchange rate falls below €0.98 to £1 before December 31st, 2017. However there will be no change after February 1st, 2018. If this means that you have to pay an increase of more than 10% of the price of your travel arrangements, you will have the option of cancelling and receiving a full refund of all monies paid, except for an admin fee of £100. Should you decide to cancel: 1) you must do so within 14 days from the date on your final invoice of January 9th, 2018 2) We will provide a refund of insurance premiums paid to us if you can show that you are unable to transfer or reuse your policy. Should the price of your holiday go down due to the changes mentioned above, by more than 2% of your holiday cost, i.e. if the euro were to reach €1.10 to £1, then any refund due will be paid to you. However, please note that travel arrangements are not always purchased in local currency and some apparent changes have no impact on the price of your travel due to contractual and other protection in place.